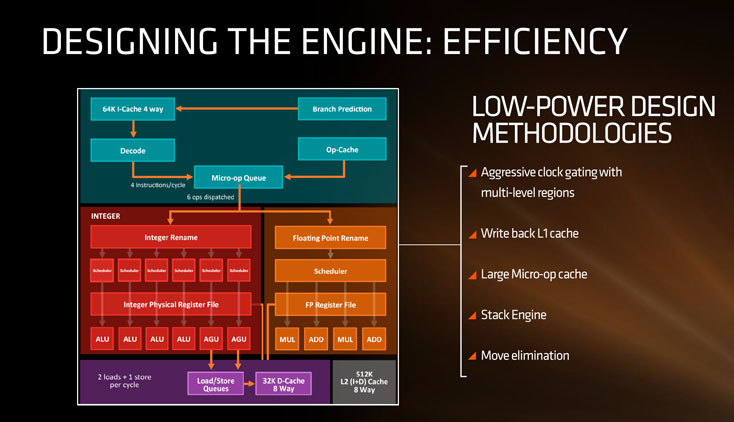 If you’re a technology lover, it’s hard to not be interested in AMD’s upcoming next generation processor architecture – Zen, which marks a radical departure from the companies older processor designs found in the current Excavator series. As someone who has been following the PC industry since the mid 90’s (yeah, I was pretty young! ), Zen is one of AMD’s most promising products, and if it delivers on the companies goals, could well be the most important CPU for the company since the introduction of the Athlon 64. Mark Papermaster, AMD’s Chief Technology Officer (CTO) recently conducted an interview to further elaborate on the design goals of Zen, what was different from the companies current processor lineup and what we can expect from the processor. We’ve known for sometime that scalability is AMD’s founding ideas with Zen, meaning we can see a large number of cores for certain usage scenarios (such as servers), or fewer cores operating at a lower clock speed for power sensitive tasks (such as ultra thin laptops and other such devices). We’ve discussed Zen’s basic processor architecture at length over a two part analysis (part 1 | part 2) and how AMD have created Zen in a modular design. At a basic and simple level, four Zen processor cores (each capable of handling two threads thanks to Simultaneous Multi Threading) are ‘strapped’ together into a single CPU Complex, along with a bunch of level 3 cache. Therefore, Mr. Papermaster is highlighting how easily they can simply add additional CCX’s to the design, and throw that together with a a bunch of GCN (Graphic Core Next) cores to create powerful APU solutions. The above graphic highlights how Mark’s team has managed some of this (for more on power consumption check out the first part of our Zen analysis), for example: Clock Gating allows the processor to quite literally turn off sections of itself when they’re not doing work, thus saving energy consumption and heat output. Because processor loads generally go up and down all the time (it’s rare you’ll find a CPU at 100 percent usage across all cores) this can be quite a big saving on its own. Micro-Op caching caches decoded processor instructions and therefore the CPU doesn’t need to fetch and decode the same instruction over and over again (assuming it’s still stored). 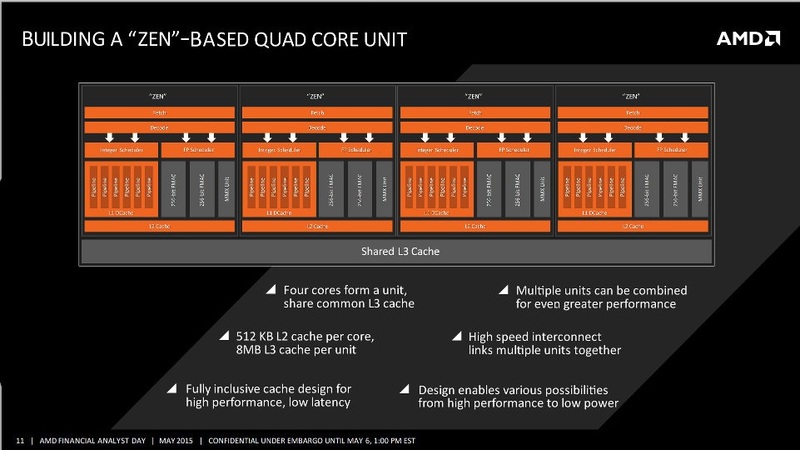 For Zen, AMD have opted to add 512K of level 2 cache per core which is private, and a shared L3 cache system which is ‘shared’ between the cores. Essentially Core 1 could peak into the Level 3 data of Core 2 to save long trips around the memory system. Coupling this with a generous number of entries for both Integer and Floating points, the processor should (in theory) be able to keep a steady flow of data from the main system RAM (which as you probably know is DDR4) to the various caches and of course, the processors execution cores. Zen also features double the bandwidth (compared to Excavator) on Level 1 and Level 2 caches, and up to 5x the amount of bandwidth for Level 3. While there’ll be Zen processors for servers and other devices, for the ‘average’ user, the most exciting CPU’s will be available on the AM4 platform, Summit Ridge. Summit Ridge motherboards for desktop have been designed to have up-to-date features such as PCIe 3.0 x16 (up to two slots if you’re using the higher end X370 platform), USB 3.1 and NVMe. Naturally the performance of Zen is still debatable – such as clock speeds, and of course the pricing too. But assuming AMD can nail good clocks and yields with the 14nm FinFET process, and do so at a good end price for customers, it’ll be an excellent solution to gamer’s who want a break from Intel. Summit Ridge Zen will be released early next year, and while AM4 motherboards are currently ‘in the wild’ they’re only available to OEM’s officially, but naturally by the time Zen is out we’ll see a good selection of motherboards to cater to overclockers and power users, or folks who want to build SFF (Small Form Factor) systems. As usual, stick with RedGamingTech for the latest information and insights. Tagged with am4, AMD, APU, Desktop, intel vs amd, processor, summit ridge, zen.